We sat in the dirt parking lot as it poured down rain. I pulled Judah into the front seat with me to nurse him. Levi climbed onto Ryan’s lap. We thought we’d eat our pad thai noodle take out and hope the rain let up. Only we found that the Noodle Box forgot to pack us forks. 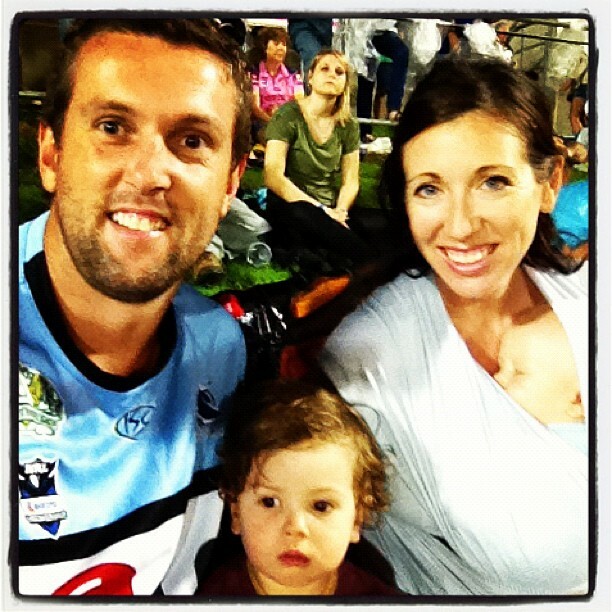 It was the only Sharks game of the season and Ryan is an avid Sharkie. We’ve missed the game three years in a row previously so this one was kind of a big deal. Tickets had been purchased a month before as Ryan’s birthday gift from Levi and Judah. Soon the rain turned into a fine mist. We thought we’d brave it. It was already 8:00pm, an hour past the boys bedtime. The game didn’t even start until 8:30. 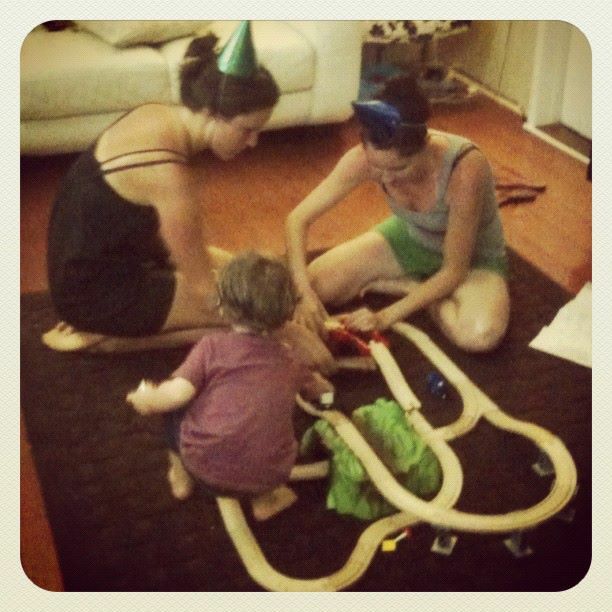 Either we’re insane, or we’re really fun parents we thought. Let’s go ahead and call it an adventure and give it our best go. Into the stadium we went. Levi loved the big screen and the fireworks that went off every time the home team (Cowboys) scored. Ryan loved watching his team win. 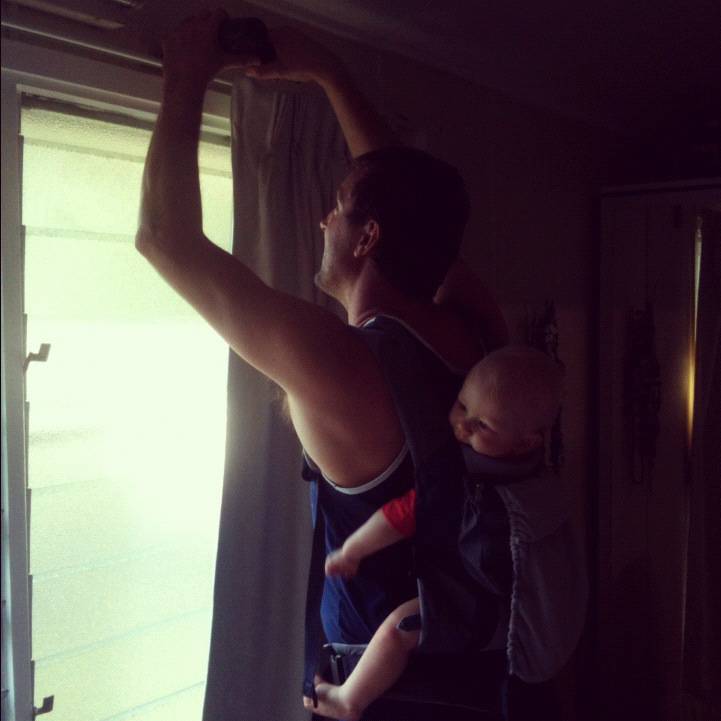 He also loved the fact that he could take his boys to the football… even if Levi wasn’t interested in the slightest. The rain held off the entire game… and began again as we walked back to the car. Our boys got to bed by 11pm that night. We ate noodles in public with our hands. There was even a celebratory McDonalds milkshake stop on the way home. Crazy parents or not, we sure did have some fun. Q for you: Are you a sporting fan? When’s the last time you did something like go to a live game? And Ryan says Levi acts like me much of the time. (He does.) Spirited, opinionated, independent, slightly dramatic. We’re still figuring our Judah’s personality. At first we thought he was pretty mellow. Laid back. But he’s making it clear that he can give anyone in this family a run for their money. Who knows? He might be a laid-back fellow, but he seems pretty passionate to us. The kid has amazing vocal ability and he’s constantly moving – kicking, wiggling, arching his back, hating confinement to strollers, car seats, or antying else with straps. He is strong and physical. But it’s early days. time will tell. There’s this weird hand-clasping/gripping thing they all do in their sleep. I once felt Ryan’s hand under my leg where he’d fallen asleep. It was around 3am and all of a sudden I felt his hand gropping – like making a fist weakly, sort of like you would do with one of those stress balls. At first I thought he was trying to wake me up… you know. No way, buddy. Are you insane? And then I realized he was just doing it in his sleep. A few months ago Levi was sick and we had him in bed with us. Wouldn’t you know it? I woke up to hte exact same thing, only smaller. And I’ve since discovered that Judah does it too. Strange thing to pass down to your children, but I’m guessing that’s what’s happened. Ryan says that I’ve passed on my foot-rubbing thing that I do to Levi. (We rub our feet together when we’re winding down to sleep – like a self-soothing thing I guess.) Apparently I got that one from my mom. Weirdos. A bunch of weirdos all doing weird things in our sleep. Q for you: What weird thing has been passed on in your family? P.S. I forgot my timer today, so I’m just guessing/hoping that this was somewhere around five minutes. The other day I drove twenty minutes across town with both of my littles in the backseat – Judah strapped into his car seat, Levi… not. I pulled in the driveway, opened Levi’s door, reached in to help him out… and saw it: the unbuckled belt. Trying not to burst into tears (and frighten him) I squeezed him tight and told him I was sorry and asked him for forgiveness and thanked God nothing happened and kicked myself for being too busy to notice and rejoiced that all was well… all at once. Between Judah crying, running late for lunch and naps, getting both kids into the car in a busy parking lot, trying not to lose it while geting the stroller folded up and crammed into our tiny trunk, and stuffing the groceries into the front seat of our car… I forgot one of the two most crucial steps. Judah was buckled, but not my Levi. That’s how amazing my husband is. Obviously he knew Levi was fine. And he knew that I would have been shaken up and ready to tear my clothes and rub ashes on my face and send myself into exile outside the city. So while some would be quick to scold or reprimand or “ugh” in disgust, he simply asked if I was ok. He gave me exactly what I didn’t deserve… but what I needed. I think about God and hte grace he gives us (oh! the GRACE that we made it home safely with no accident… I’d have never forgiven myself). And I hold in my hand such a tangible example of grace extended to me, both in our protection and in my husband’s response to my carelessness. God knows I’m sorry. God knows I’ve learned a lesson. God knows that rebuking me would do nothing to make things better. Apparently my husband knows all that stuff too. That day I saw God in the response of a man. How grateful I am for him, and to get to wake up tomorrow morning and celebrate the most glorious day he was born. Ryan: God’s grace to me. Adriel also writes on motherhood & parenting at The Mommyhood Memos. A few months ago my husband met another woman. He’s been very open about it. Accoring to him, she is incredible. She is changing his life, making him a better man. Her name is Siri, and she lives in his phone. I, however, am not convinced. Ryan: Siri, send a reminder. Siri: What is your reminder? Ryan: Take Emma to the Mac store. Siri: Take Anna to the Macsta. See? Siri is not the sharpest tool in the shed. Ryan: Tell me a joke. Siri: I can’t. I always forget the punchline. Ryan: How do you bake a cake? Siri: I can only look up local businesses in the United States. What??? Talk about a communicaiton breakdown. [Trying again with the joke thing.] Ryan: Tell me a joke. 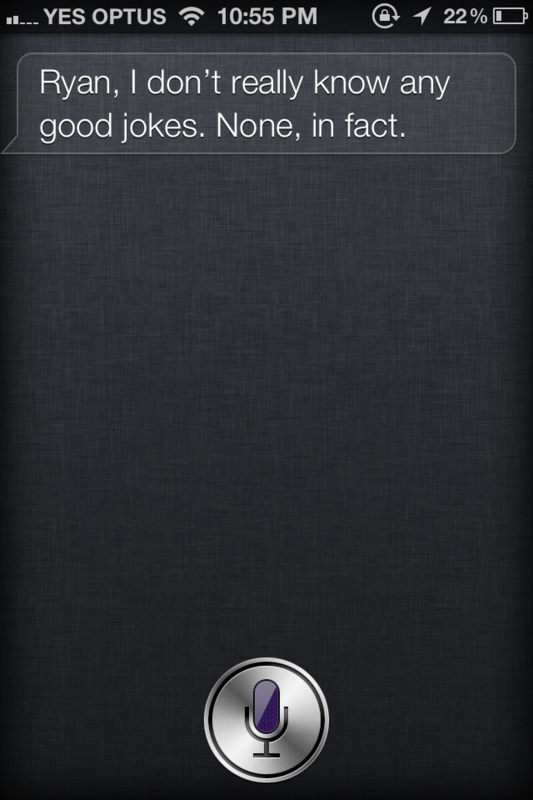 Siri: Ryan, I don’t know any good jokes. None, in fact. See? Siri is boring too. Unintelligent, forgetful, poor listener, dull. She is obviously no threat to our relationship. Q for you: Do you own an iphone? 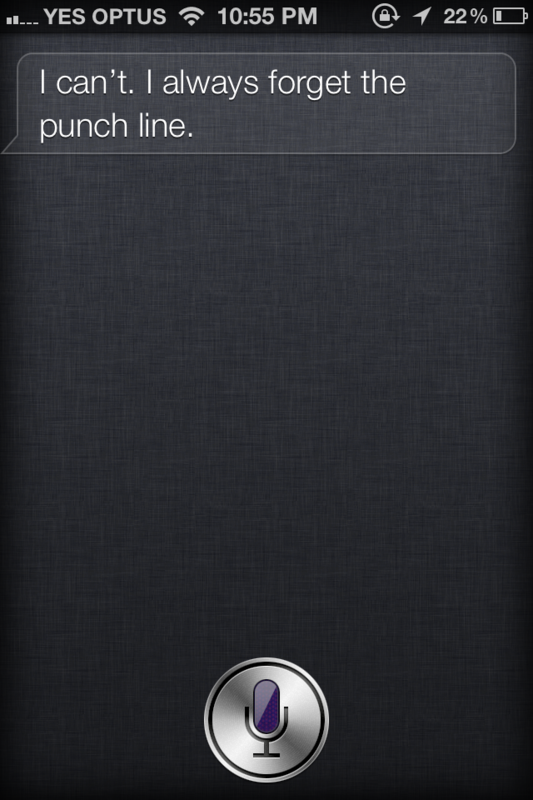 My husband swears that Siri is helpful, but I beg to differ. Have you had success with her? Just another deeply profound post from me.